When I was 5 years old, I stayed “Kyoto tower hotel” with my parents. It was my first trip to stay a western style hotel. Everything was first experience. I used a bed. I used knife and fork. And I used bathroom. A western bathroom had toilet and bath. I thought, theses were difficult to use. And I had strange questions, when I was young. First, I thought a western style bathroom had curtain. They didn’t wash their body at outside bath. It was difficult to wash my body to not spilt hot water. After I washed my body, it was not good to take a bath in dirty water of soap. After several years, my mother and I realized, when they took a bath, carten was inside bath. Second, western bath room has a bath and a toilet. I was very confused. Someone take a bath, someone use a toilet together????? After several years, western style house had some bathrooms or some shower rooms. Third, when I studied English in my junior high school, my teacher said “you don’t use this word ‘toilet’. It is very straight meaning. You have to use 'bathroom'." I thought their stations had bathrooms that had baths and toilets??? Anyway, I am not good at taking a bath in a western style hotel now. I don’t feel relaxed. And my children don’t have my same questions. So western styles are very popular in Japan now. You think my questions are very strange. Not strange at all Lucy! When I first travelled in Europe I didn't understand the "bidet" next to the toilet. Didn't have a clue what it was for. I had the pleasure of having a shiatsu massage, steam bath and Japanese style bath at Kabuki Hot Springs in San Francisco a long time ago. It was heaven. Makes more sense the way Japanese bathe. I like this topic, it gives the reader insight into Japanese culture. In Hungary, we have bidets, too in many of the houses. 2.) this is pure eufemism. A curtain in the bathtub is not really for privacy it is usually only closed when you are going to stand and take a shower, instead of laying in the tub. The Curtain is to keep the water from the shower head (above you)from spraying into the room. We generally don't share the bathroom at the same time. Usually we announce "I am taking a bath does anyone need to use it before I do?" Then there is nobody using the toilet beside a bathing person! because that's just icky! I believe in Europe they use the term "toilet" because often the toilet is in a separate room from the bath tub. So you must tell us how you use the bath in your home? Yeah, usually in the US everything is in one room. The toilet, sink and tub. Sometimes in master bathrooms in houses there are seperate tubs and showers and sometimes they have the toilet in it's own "water closet" I think they call it. I've never really understood why the bidet didn't become popular in the US. Probably because it was seen as some European elitist thing. On a side note, about half of the households here in Europe have an 'all-in-one' bathroom, with toilet, tube, basin, etc all in the same room. according to my experience, about half of the houses have a separate room for the toilet only, usually with a ridiculously small hand-wash basin and another room for tha tube, shower, whatever. Sorry for my interruption here, let's hear Lucy about the Japanese custom. When I stayed a hotel in Paris, I saw "bidet". I didn’t know abut it. After our trip, I heard Japanese don't know how to use it. Someone used it to wash his face. Someone used it to wash his clothes and shoes. Thank you. I thought you didn’t like this story. Because it was not beautiful. But toilet is important for us. 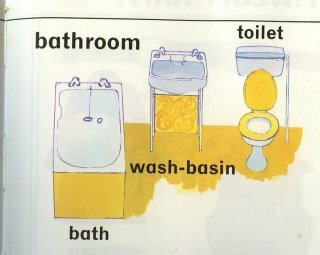 Some day, I want to write about western toilet. When I was young, I thought you shared the bathroom at the same time. Almost Japanese like to take a bath. We take a bath to leave our tired of one day. Almost Japanese houses have bathroom which separate toilets. But apartments for one people have like your bathroom. So really I wanted to write about western bathrooms. Lucy, I like every story that tells something about different cultures and customs. Toilet and bathroom use is important. So speaking about this topic is important, too. It is fascinating to read about someone's take on what Americans consider so common! Yeah, we never refer to "the room with the toilet" as "the toilet." Instead, "bathroom" is used (even if there isn't a bathtub or shower) or "restroom."